L-Gel is a coating that was developed at Lawrence Liver-more National Laboratory (LLNL) in Berkeley, California. 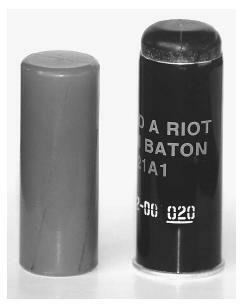 An old baton round, left, and one of the new baton rounds, right, also known as plastic bullets. The plastic bullets expand upon contact and release most of their destructive energy before penetrating vital organs. The coating is effective at decontaminating areas exposed to both chemical and biological agents. The need to decontaminate spills of a liquid or powdered poison or infectious organism is potentially urgent. In order to prevent injury from chemical or biological warfare agents, for example, the source agent must be contained before anyone touches the material, or before the agents become dispersed in air currents. For example, a spill of powdered anthrax spores can become airborne if not contained quickly, and could travel throughout a building's ventilation system. The development of L-Gel began in the 1990s. Among those striving to develop a nonhazardous, portable, and inexpensive decontamination reagent were LLNL researchers. Their L-Gel formulation incorporates a chemical compound called potassium peroxymonosulfate into a material called silica. Potassium peroxymonosulfate is an oxidant. That is, it contributes an electron to the chemical bonds of the target compound, which disrupts the bonds that hold the target together or make it active. Bleach is another oxidant. However, bleach produces noxious fumes, making its use in confined settings dangerous. Bleach is also corrosive, and could damage equipment that is being decontaminated. The acidic nature of the peroxymonosulfate oxidant proved effective against a variety of biological agents, including anthrax spores. Spores such as those of anthrax have several hard coats that are very resistant to chemicals and physical stresses such as heat, ultraviolet light, and temperature. Acidic oxidants, however, can break apart the proteins that make up the outer coats. The oxidizer can then enter the core of the spore, which houses the genetic material, and can destroy the nucleic acid that is vital for the germination of the spore into a growing and infectious bacterium. The oxidant is incorporated into a gel. The thick gel is able to cling to surfaces better than water, and remains where it has been applied. A water-based solution will spread out and could even run down an inclined surface, which could further disperse the poison or infectious microbe. Another advantage of a gel is that the oxidant is kept in contact with the target longer than would be possible if the oxidant was dissolved in water. L-Gel is effective at killing over 99% of populations of bacteria including Bacillus anthracis (the bacterium that causes anthrax) and Yersinia pestis (the bacterium that causes plague). Surfaces as varied as carpet, wood, and stainless steel are all efficiently decontaminated with L-Gel. During the fall of 2001, letters containing anthrax spores were sent to a number of locations in the eastern United States. L-Gel was successfully used to decontaminate offices of Congress and at the American Broadcasting Company's (ABC) newsrooms. Research is underway to produce L-Gel capsules that could be blown into ventilation ducts, where clean up of chemical and biological agents is especially difficult. Raber, E. "L-Gel Decontaminates Better Than Bleach." Science and Technology Review. (March 2002): 10–16.